IT’S PLAYTIME! No dog wants to stay home all day when they can play with their furry friends at Y Bark Alone instead! Come let your dogs get pampered and enjoy their day with us! A brief afternoon walk is nice, but it’s no substitute for hours of real exercise and playtime. At Y Bark Alone our four legged friends are never bored, frustrated, or anxious. All the dogs keep busy whether they are playing with friends and staff, lounging around on cots, or just kicking back to watch the other dogs. We have an outdoor area that is completely fenced in. 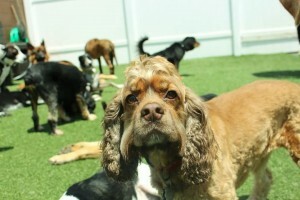 The daycare allows the dogs to play in both indoor and outdoor areas throughout the day. The dogs like to sunbathe, nap, and play in our mini pools when it’s hot out! Not to mention, the dogs need their area to potty train and keep up their good bathroom behaviors. At the end of a regular play day, you and your dogs are ready to relax and get some rest to recharge for the next day! 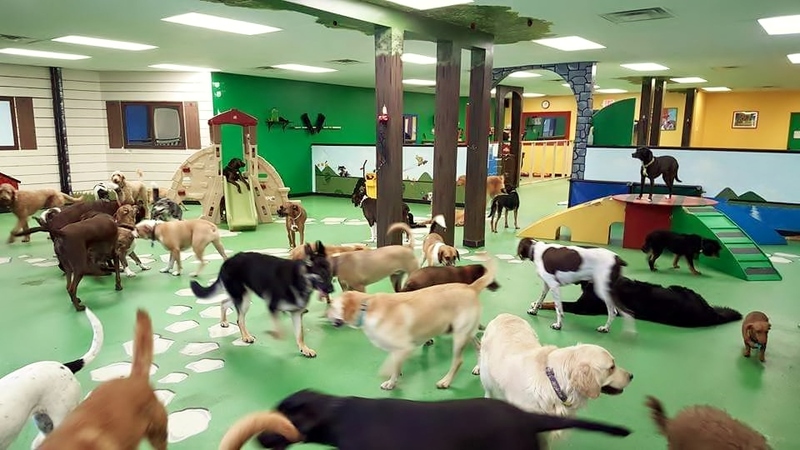 The daycare is actually providing much more than just fun and play for our pups! What most don’t realize, the dogs are developing socialization skills more and more each time they come to visit. The daycare and our staff also help curb destructive behaviors, help to decrease separation anxiety, and as we all know, all that exercise makes for a happy healthier dog! To keep everyone safe here at Y Bark Alone we take many safety precautions to make sure every dog in the facility has the proper vaccinations required to enter. Daycare and boarding both require rabies, bordetella, dhlpp, and must be on a flea & worm preventive. Puppies must be at least 16 weeks old and current with the vaccines required for their age. Grooming on the other hand, only requires the rabies vaccine. These vaccines are necessary to keep your dogs and all of their friends healthy. Our outdoor fence reaches 6 feet in height to keep all of the dogs in with no distractions from the other side of the fence. The staff is very aware of each dog in the room and prevents any funny business from taking place. 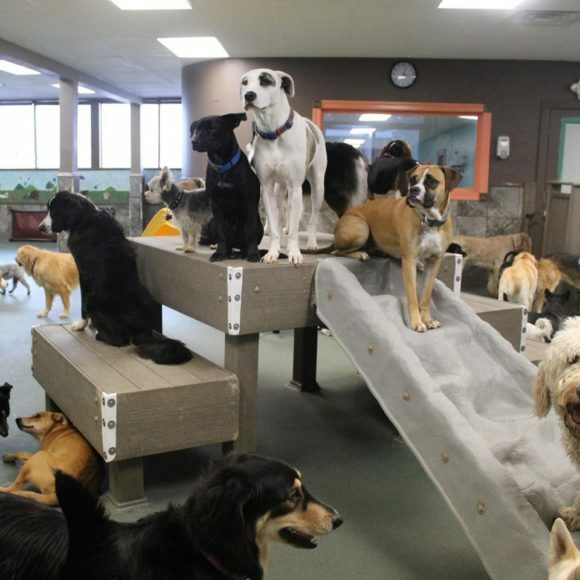 We learn and appreciate each dog’s unique personality to help maintain a peaceful daycare room. Took my cat in for a grooming (brushing and nails clipped), and they did a great job in only 10 minutes. When I signed in at the front desk, they told me my pet gets free baths on his birthday, too.The groomer and front desk person were both incredibly friendly and helpful! Love this place! I brought my dogs here for boarding a few mounts ago and the employees were very friendly and welcoming. Today I brought one one my dogs in for grooming and I couldn't have asked for a better experience. The groomer actually listened to what I wanted! affordable too! Wish I would have found this place sooner. My Polish Tatra Sheepdog has never been whiter! Great job! My two dachshunds absolutely love it here! The facility is spotlessly clean, and my two always come home exhausted and happy- and smelling good! There's enough space for all the dogs, separate area for the little ones and the staff are genuinely caring and concerned with every dog's heath and wellbeing. All of the staff was very friendly. Not only were they wiling get us in right away, they also offered advice about local pet care options and places where I could save money. They weren't trying to sell me anything which was so nice. And it was obvious that my dog and I's happiness was priority. They have super convenient hours so if you need to drop off your dog early on your way to work or pick up your pup after a long day they they will be ready for you. We have been coming here since they opened and won't go anywhere else. I recommend giving them a try. You and your pup will be glad you did! I had an ABSOLUTELY EXCELLENT experience when taking my dog in to get groomed. I would highly recommend Y Bark Alone for any dog needs! They were incredibly helpful, friendly and accommodating to me and my pet, by even trying to come out to the parking lot to get my dog so I didn't have to get my kids out of the car. Now that is thoughtful! !